It seems fitting that on the day the Internet has exploded with derisive commentary about Alex Billington calling 911 because someone was texting during a screening that we get this new video championing a “two-screen experience” for a theatrical rerelease of The Little Mermaid. If you’re not up on techno lingo, a two-screen experience basically means you and your kids can watch the movie on the big screen while also playing games and interacting with the film through an app on your cell phone or iPad. This might be the worst idea ever. Have we all become so ADD addled that we need something to entertain us while we watch something that was designed to entertain us? The two-screen experience is not a new thing – it’s been a staple of television for the past few years, where networks like AMC provide ancillary information to viewers of shows like The Walking Dead and Breaking Bad. The thing is, that’s in the comfort and privacy of your own home, so if you want to sit around tweeting (which judging by my feed on a Sunday night, many of you do), or playing crappy flash games, or partaking in stupid viewer polls while missing the actual show, that’s your loss. However, moving this to a theater – and using a kid’s film – seems like the latest salvo in the war to make using your phone during a film okay. It also seems like a clever move to indoctrinate younger viewers into the practice. 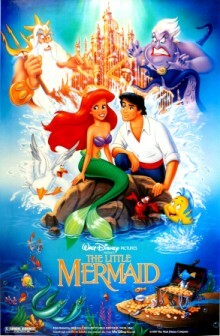 Kids see things like The Little Mermaid two-screen experience and grow up thinking all films should have an app that allows them to play along in the theater. Woe be unto those of us who actually want to watch the movie we paid $15 to see should this ever become the norm. The one potential positive here is that these screenings of The Little Mermaid will be marketed as second-screen experiences, so you know what you’re in for before you plunk down your cash. That being said, this feels like moving one step closer to the awful idea of having specific auditoriums at all theaters designated as “cell phone friendly” zones. I hate to sound like a cranky old man, but that’s a future I want no part of. Check out Disney’s hard sell for the two-screen experience below, then let us know what you think. Should theaters be designating some screens safe for cell phone and tablet use or should this kind of behavior stay at home, where it affects no one aside from your significant other and children?